Ceiling fans are a great way to keep the room temperature low during the summer and the electric bills even lower. Some ceiling fans come with a light combo so they can be multifunctional and you can definitely use them for both indoors and outdoors. Most ceiling fans, however, can be noisy so it can be slightly distracting. It’s also worth noting that not everyone is impressed by the aesthetics of a ceiling fan either as a cooling device or a lighting fixture. Plus, it’s really difficult to clean them. So if you’re looking for something to keep you cool but don’t want to use a ceiling fan, we’ve got you covered with our list below. Because you can choose tower fans with varying numbers of options, it’s fairly easy to find one that will be in your price range. Tower fans that have remotes can easily be controlled from anywhere in your home. Because they have a number of different speed settings you can easily control how fast the fan operates and how much air it moves around in your home. Even the less expensive models usually come with a number of features so that you will get the most out of your new fan. There isn’t any safety concern with tower fans, as the fan blades are all safely encased inside the unit. This means that children won’t be able to accidentally put their fingers into the fan and hurt them on the blades. Due to their shape, you can easily fit tower fans into smaller or more cramped areas of your home. They look great when placed in a corner and won’t stick out the way that other types of fans will. Unfortunately, tower fans are not a good replacement for air conditioning, as they do not have the power needed to cool a very large space. While most tower fans are relatively quiet, there are some models that are louder than pedestal fans, so it’s important to do your research before making a purchase. These fans do oscillate, but it is impossible to adjust the airflow up and down or side to side, which makes it difficult to control exactly what area of the room will be affected by the fan. These units are relatively inexpensive, even if you opt for some of the more powerful options available on the market. If you are in sudden need of a window unit, you may be able to borrow one from a friend or neighbor until you buy your own, as they are highly portable. They don’t cost anything to install since you can easily complete the installation on your own. Window AC units only cool the room where you have them placed, which will decrease the amount of money that you spend on your power bills each month. Since they are relatively cost-effective, you can easily buy a number of these units if you want to cool more than one area of your home. They can easily be turned on and off so that they don’t run longer than you want them to, and when installed correctly, they are very efficient. There isn’t a lot of fear of dust and debris getting into the home around the sides of the window AC unit as long as you install it correctly and ensure that there aren’t any cracks or gaps. While they will quickly cool down the room where you have them installed in the window, these units will not create enough cool air to make the rest of your home comfortable, as well. It’s normal to have to deal with hot spots as well as cold spots in your room when you use a window AC unit, as they are not nearly as efficient at circulating air throughout the room as other options are. People who have asthma or allergies will not experience a lot of relief when using these units compared to a whole-house AC system. Central air conditioning is an incredibly effective way to circulate air throughout your home and cool down your space. These systems provide incredible air filtering which will do a great job at removing dust and debris from the air, which is great if you have allergies or asthma and are worried about air quality. If you want to make sure that your whole house is cooled, then this is your best option. In general, you will enjoy even air temperatures throughout your home. While there may be some cooler or warmer spots depending on the location of your vents, for the most part, your home will be an even temperature. Unfortunately, central air conditioning units are rather expensive to have installed, and you need to hire a professional to do the work for you. These cooling units are the most expensive option on the market since they are designed to cool your entire home, not just the room where you are. If your air conditioner breaks down, then it is very expensive to have it professionally repaired. It’s incredibly easy to control your airflow and which direction it is going in when you use a pedestal fan. Because you can tilt the head of the fan up and down and side to side, you can opt for a directed blast of cooler air in your home or allow the fan to move gently from side to side. Having the ability to adjust your fan speed means that you can control how much air circulates in your home and whether or not it is going to be uncomfortable for people in your space. If people get chilled, you can easily adjust the fan to blow in another area without compromising having airflow in your house. Pedestal fans are generally very powerful due to their larger blades and very large fan area. They can easily circulate air in a very large space. Unfortunately, pedestal fans don’t do much to improve the appearance of your home and can be thought of as an eyesore. 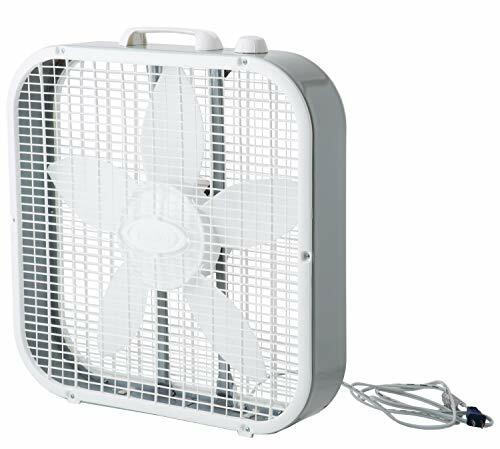 Because pedestal fans are so powerful, they are not ideal for use in smaller spaces. If you do try to use a pedestal fan in a small room, then you may have difficulty keeping papers from being blown away or finding the right speed for your comfort level. Pedestal fans do not improve the air quality in your home; they simply move the air that is already in your space around to make you feel cooler. Any dust that collects on the fan blades can be spread throughout the room when the fan is turned on. These fans tend to be much noisier than other options. Due to their height, they are easy to knock over, which can be a concern if you have children or pets in your house. Additionally, children who try to touch the fan blades can hurt themselves. These fans can be mounted both on gables and roofs, making them accessible for many homeowners. Because they work by exhausting the hot air from your house to the outside, they do a wonderful job of helping to cool down your living space, which can decrease your monthly bills. Attic fans remove moisture from the air inside your home, which can help to reduce the risk of any mildew or mold growing in your house. You won’t have to worry about having damp spots or rooms in your home when you run an attic fan. Dirt and dust will not be able to settle in your home since the attic fan will keep air constantly flowering and moving. By removing a large amount of air from your home each day, attic fans do a great job of cleaning the air in your home and removing dust and debris. They may help to raise the value of your home when it is time to sell your property, as many people like using an attic fan to cool their home and ensure that they have proper airflow. Without enough airspace to operate, the attic fan can actually remove some of the cooler air that you are trying to pump into your home. Depending on the area where you live, your attic fan may draw in a lot of bacteria and germs from outside. This can be very problematic and contribute to your family members having more health problems than normal. If you use an attic fan at the same time as a ceiling fan, then you may notice that moisture will tend to accumulate above the blades of the ceiling fan. This can cause mold or mildew problems in your living space. Too much insulation in the attic can make it very difficult for your attic fan to work properly, as the insulation can actually block the airflow, causing problems. These lightweight fans can be moved from room to room when you want to cool a specific area of your home. They can be used in the window as a window fan and will help to bring cool air in or push hot air out of your home. By placing ice or cold water in front of your box fan, you can ensure that your fan is blowing cold air throughout your room. Box fans are relatively inexpensive. They are not ideal for use in a window as they are not designed with the right shape. This means that dust, pollen, and bugs can all enter your home. It’s not easy to adjust exactly where the air will be blowing, and since the fan doesn’t vacillate, you won’t be able to enjoy cool air blowing throughout the whole room. A table fan is a small to medium-sized fan that’s used to ventilate the space in its proximity. It’s portable so it’s easy to place and can have a wider reach or equal distribution of air circulation as long as it’s placed on a steady horizontal surface. They’re also budget-friendly and consumes only about 50 to 100 watts. Humidifiers add moisture to the air when it’s dry and the environment arid. You can use the cool mist humidifier makes it possible to humidify a room without raising the room temperature. It can even make your room feel cooler. If you have a small unit and don’t want to share your only window to an AC, the portable AC is one of your best bets. They’re perfect for keeping small rooms cool and they come with wheels so it’s easier to move them around. Bladeless air fans are innovative fans that are quieter, more power-efficient, and safer. The models also look sleek so it’s easy to incorporate them into a modern-style or contemporary room.